With 300 days of sunshine each year & no lift lines, skiing in Telluride Colorado is an epic experience. The region receives on average more than 300 inches of snow annually and offers more than 2,000 skiable acres for all ability levels. Telluride Ski Resort is recognized internationally as a premier ski and snowboard destination. The terrain is legendary and has always been revered as the best of Colorado. Nestled in a box canyon in the San Juan Mountains of southwest Colorado and surrounded by the highest concentration of 4,200-meter peaks in the state, Telluride is a hidden gem in the Rocky Mountains. Founded as a mining town in the late 1800s, Telluride is steeped in history with stunning scenery. Its blend of historic architecture, world-class hotels, spas and independent restaurants make any visit unforgettable. Once you arrive in Telluride, there is no need for a car. The town of Telluride is just eight blocks wide, so everything is within walking distance. If your legs are tired from a long day on the slopes, hop on the Galloping Goose, a free, eco-friendly shuttle that loops through town every 10 minutes. You can hail it from any street corner on its route. Mountain Village is perched above the valley floor at 9,500 feet, providing access to the Telluride Ski Resort and Uncompahgre National Forest. 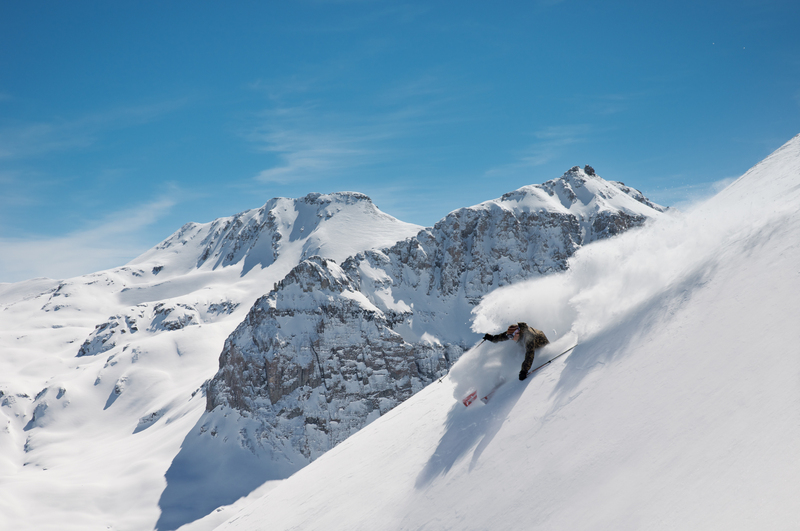 Telluride is a powder-seeker’s nirvana. And for good reason, there won’t be crowds or a lift line in sight. And it has a sweet balance of terrain – 23 percent beginner, 36 percent intermediate and 41 percent advanced/expert. Great snow conditions and crowd-free runs. Breathtaking scenery. Expansive side country and hike-to-terrain that provide an in-bounds “backcountry” experience. Should you decide to take a break from carving turns, You can enjoy everything from snowshoeing and Nordic skiing to sleigh rides and big tire bike tours or go fly fishing. Traveling between Telluride and Mountain Village? The two towns are connected by a 13 minute free, scenic drive with the gondola—the only transportation system of its kind in North America. In the winter, ski and snowboard racks are mounted on the exterior of cabins, and gondola attendants help load equipment. The Gondola is pet friendly and disabled-accessible. It’s also eco-friendly, fun and offers unbelievable views and an unforgettable “commute”. Gourmands can find haute cuisine, complete with an enviable wine list, innovative menu and the freshest, finest ingredients. Telluride is home for some of the country’s most celebrated chefs. Whether you’re looking for a fresh pizza, foie gras, or free-range steak, Telluride offers everything from casual pizzerias to on-mountain French and Italian eateries. Condé Nast readers ranked Telluride in their Top 20 List of Best American Cities for Foodies. And Fodor’s ranked Telluride in the Top 10. USA Today ranked Telluride Top 5 Ski Resorts for Nightlife. So wander Main Street for some saloon hopping, catch some live music, or tuck into a wine bar and enjoy our friendly, festive atmosphere for yourself. PRIVAIRA provides private jet charter flights in and out of Telluride, Colorado. Flying privately allows you to make the most of your vacation by allowing you to select flexible departure times or access more private airports in close proximity to Telluride. There are 7 airports within a 50 mile radius of Telluride. The most popular airport is Telluride Regional Airport (TEX), one of the most beautiful airports to fly into. It offers spectacular views of the San Juan Mountains and is located only six miles from Telluride’s town center. Montrose Regional Airport (MTJ) along with Hopkins Field Airport(AIB) also serve Telluride and are both located approximately 60 miles of the town. Next PostWhich category private jet is right for you?